This is my original Ze do Caixao fan site, created in 2004. For posterity's sake, it will remain unchanged. However, as Dr. Pretorius would say, there have been "developments." Follow the link below and see for yourself! I knew it would happen sooner or later. Yes, after 15 years of collecting monster toys, I have finally flipped my lid. 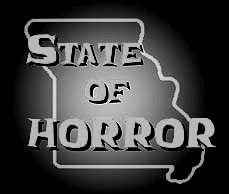 You are looking at pictures of me dressed as one of my favorite horror characters. This distressing page is my humble homage to Brazilian horror maestro Jose Mojica Marins. 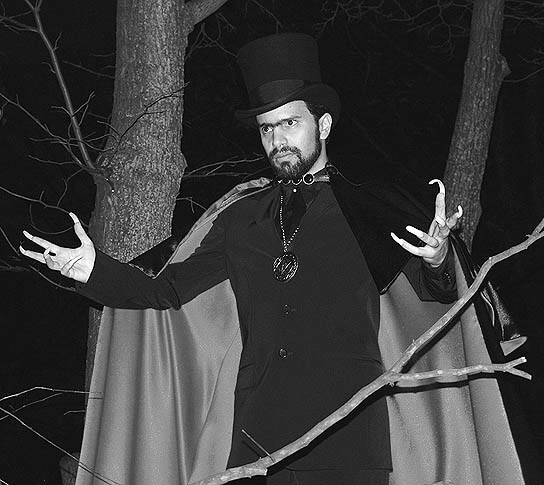 In 1963, the innovative writer/director/actor created the iconic character Ze do Caixao (roughly translated as "Jose of the Coffin"), better known to American fans as Coffin Joe. The black-clad undertaker terrorizes his countrymen, letting no one stand in the way of his quest to find the "superior" woman to bear his child. Even in death, he returns to torment the living in dreams and hallucinations. Ze do Caixao's top hat, cape, beard, unibrow and long fingernails are instantly recognizable to generations of Brazilians who grew up with this national bogeyman. Brazilian mothers are known to tell their children, "Ze do Caixao will get you if you don't behave." Unlike typical villains, Ze do Caixao is psychologically complex. He is undeniably evil, but his position as a social outsider makes him sympathetic. Despite his selfish cruelty toward adults, Ze do Caixao loves children and would give his life to protect them. He claims to be an atheist, yet he rails against God. Only in recent years has Marins' work finally garnered attention outside his native land. 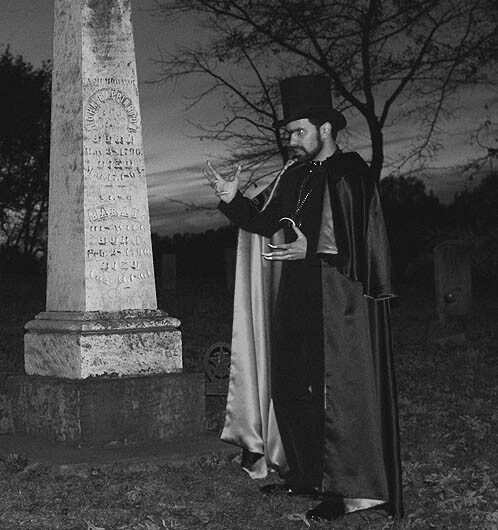 The release of subtitled Coffin Joe films in the United States and Europe earned Marins a new cult following. Thousands of young fans are discovering the disturbing, surreal horror movies Marins directed 40 years ago. 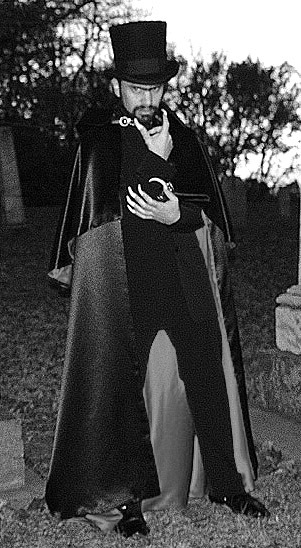 For Halloween 2004, I decided to dress as Ze do Caixao/Coffin Joe. The costume seemed simple enough, but assembling it proved a surprising challenge. I searched high and low for the right top hat, finally settling on one from Hats In the Belfry in Maryland. It's not 100 percent accurate, but it's as close as I could find. The buttons on the cape clasp are dead-on. They came from a quaint button shop on historic Main Street in my home town of St. Charles, Missouri. The cape itself required two weeks of work from a very talented and dedicated seamstress named Vilaiwan Mathis, of Continental Cobbler in St. Charles. She created a beautiful piece of real clothing, nothing like those phony capes you see at costume shops. The black jacket and pants are a two-piece Theory suit from Loehmann's in Los Angeles. The fingernails are salon tips that I cut and filed myself. I glued two together to create the hooked left thumbnail. 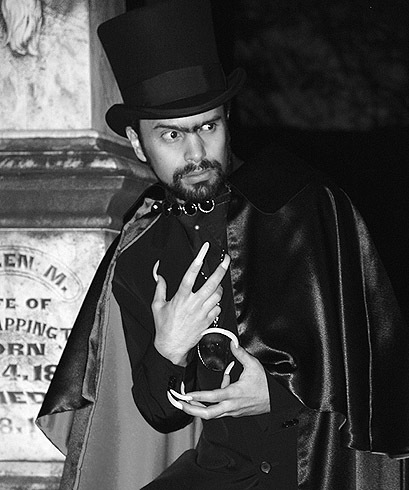 The beard is my real facial hair, but the unibrow was created with crepe hair and spirit gum by my friend and fellow monster fanatic, Max Cheney of St. Louis. Max went above and beyond the call of duty to take these digital photos Oct. 30 as the sun set in one of the St. Louis area's oldest graveyards. Max threw himself into the project, rolling around on the ground and hanging off a steep hill to get these shots. Thank you Max! 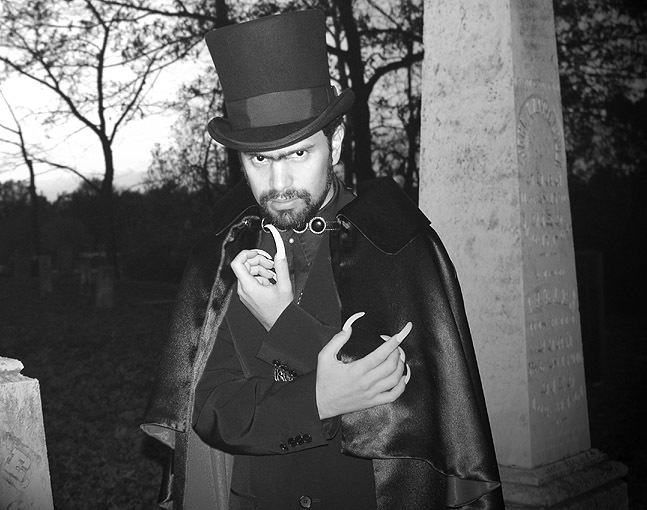 Just to be clear, these are pictures of me, Raymond Castile, not the real (and much cooler) Coffin Joe. But if you watch his movies, I think you will agree that Max and I did a pretty good job bringing Joe to life for a few hours one Halloween Eve in the Show Me State. And while you're thinking about Coffin Joe, why not go ahead and watch some of his movies? Start with At Midnight I'll Take Your Soul, then proceed with caution to This Night I'll Possess Your Corpse, finally ruining your mental health by watching Awakening of the Beast. All three are available on DVD from Fantoma in the United States. Three more Ze do Caixao films are available on Brazilian Region 1 DVDs - The Strange World of Ze do Caixao, End of Man, and Hallucinations of a Deranged Mind. Give them a chance. You have nothing to lose except your mind. In April 2006 I received word that Jose Mojica Marins visited this page and was very impressed! Knowing that Mojica liked the site made the whole project worthwhile. I thought that would be the end of it, but there was more to come! In October, Mojica contacted me again through Dennison Ramalho, assistant director of the new Coffin Joe film, Encarnacao do Demonio. I could not believe the news. Mojica wanted me to be in the film. Not only that, but he wanted me to play Coffin Joe as a young man in a flashback scene connecting the new film with the end of This Night I'll Possess Your Corpse! What followed was an incredible adventure that I documented in my new Web site, "Diary do Demonio." In case you missed the big icon at the top of the page, here it is again! The Coffin Joe Trilogy has been airing frequently on IFC in the United States as part of their Friday night "Grindhouse" presentation. Check listings to find out when you can catch At Midnight i'll Take Your Soul, This Night i'll Possess Your Corpse, or Awakening of the Beast on IFC.